DA Form 4916 - also known as the "Certificate Of Service/attempted Service" - is a Military form issued and used by the United States Department of the Army. The form - often mistakenly referred to as the DD form 4916 - was last revised on June 1, 2009. Download an up-to-date fillable PDF version of the DA 4916 below or request a copy through the chain of command. For use of this form, see AR 27-10; the proponent agency is OTJAG. 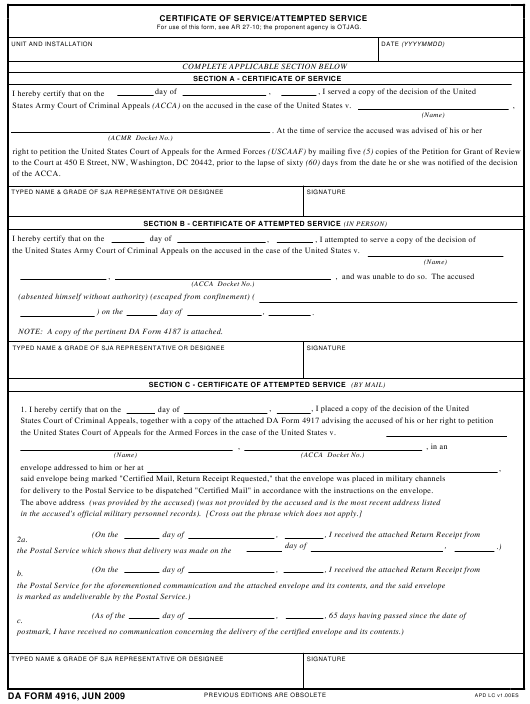 States Army Court of Criminal Appeals (ACCA) on the accused in the case of the United States v.
the United States Army Court of Criminal Appeals on the accused in the case of the United States v.
NOTE: A copy of the pertinent DA Form 4187 is attached. the United States Court of Appeals for the Armed Forces in the case of the United States v.
for delivery to the Postal Service to be dispatched "Certified Mail" in accordance with the instructions on the envelope.